35 minutes - Cooking time will vary if you’re making your own pulled pork and red cabbage. 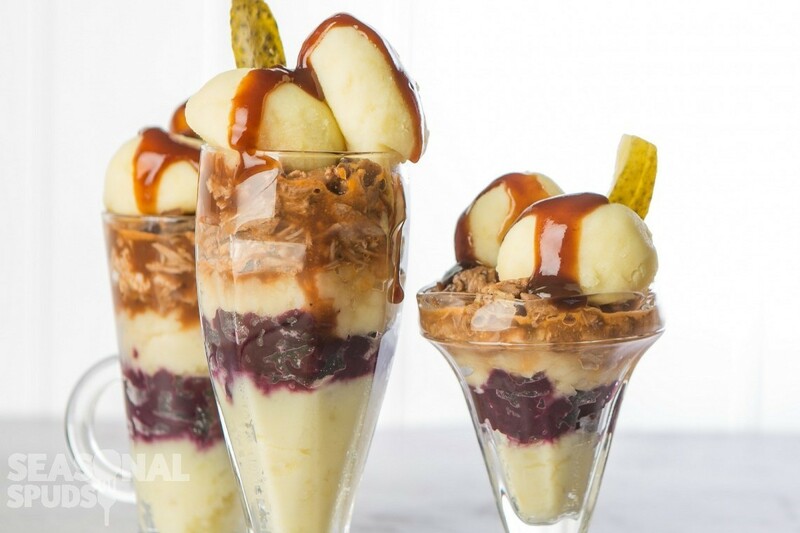 Fool your friends and family this April Fool's Day with this deliciously layered potato sundae. 1Peel, chop and boil the potatoes in salted water. Once cooked, mash with the milk and butter. 2At the same time as the potatoes are boiling cook the pulled pork as per instructions. 3Cook the red cabbage as per instructions and prepare the pulled pork sauce. Cut the pickled cucumbers in half. 4Assemble the sundae by starting with a scoop of mash, followed by some red cabbage, more mash then some pulled pork and sauce. 5Top with ice cream scoops of mash, pour over more sauce and place a pickled cucumber in each.